From a single large parcel in the heart of the original Charlemagne vineyards of Corton. Separate fermentation of each vineyard block. A year in barrel with late summer malolactic. Full six months on the fine lees in tank. A golden color. A pungent, broad, forward nose: slightly exotic yellow tropical fruit, malt, caramel corn and curry flavors. Turns richer on the palate, medium-full: ripe melon, carob, soursop, coconut cream, all honey-kissed and seasoned in a leathery spice. A Martray with love handles … maybe even a little back fat showing too. 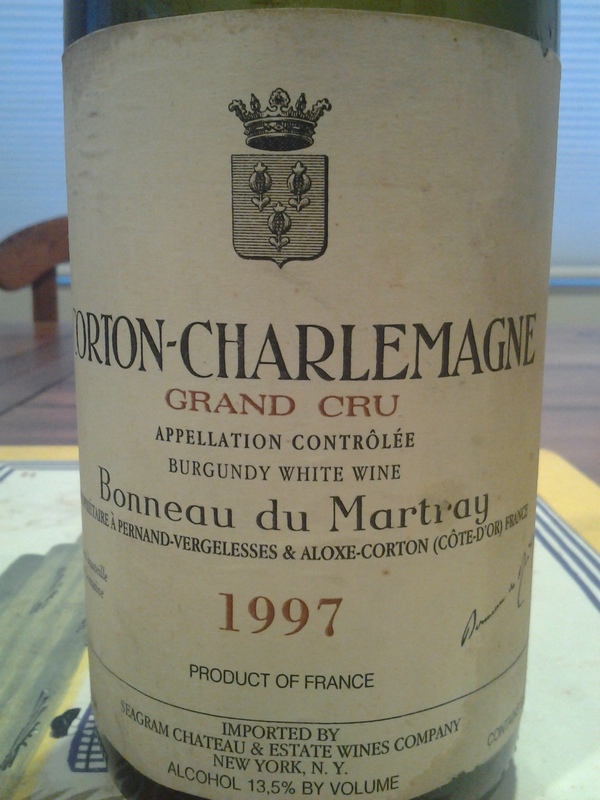 Certainly not the ‘lion in winter’ we have come to expect from this producer; this ’97 Martray is soaking wet. Not entirely without focus and lift though; for the ’97 vintage, this actually has respectable acidity and minerality. So it’s not greasy. Interesting wine but not the usual dimension and diamond-like complexity of a true Martray. This is not going to spill over the side tomorrow but drink up if you have them in your cellar.